Our customers can also take advantage of our super competitive fabrication and installation prices. We offer excellent craftsmanship and prompt service that enables our customers to enjoy their new bathroom or kitchen countertop within two weeks after they purchase their granite slab(s). Experienced technicians who visit your home, measure your project and produce exact templates for your granite counter tops. If desired, you are free to visit the warehouse and do a layout with us, where your templates will be placed on the actual slab of granite for you to help determine which areas or components of the slab you would like to feature or be located in particular areas. From these templates and layout, the granite slabs are cut by our skilled fabricators using diamond blades on a large bridge saw to ensure that your countertops are cut and shaped to the precise dimensions of your project. Once the granite slab has been cut, it is polished by hand and the particular edge your have selected is put on the slab. 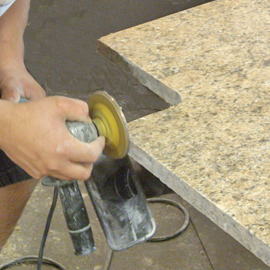 The fabricated granite pieces are delivered to your home and installed by our trained crews to fit beautifully into your kitchen or bathroom. Undermount sinks are mounted and secured to the underside of the granite and the faucet and other holes are cut on-site and dry-fitted to ensure a proper finish.